This is my update from Amsterdam on day two of our Naked on Pluto residency. Marloes’ report on day 1 is here. Today was all about taking the themes from yesterday and making them into concrete game mechanics we can use. 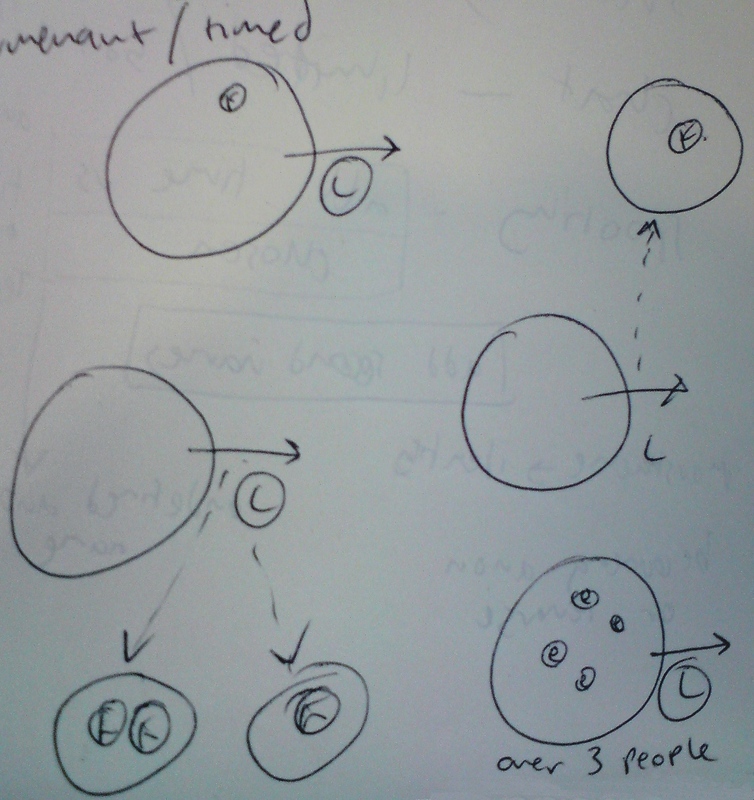 We started by mapping out possible constraints imposed by multiplayer activities. We want a large amount of what you do on pluto to be coordinated with other players – and this impacts on the logic of the game world. For instance, doors can be locked – sometimes in a room full of people we only want players who are carrying a key to be able to get through the door, at other times a single player might be able to unlock a door for everyone (perhaps for a limited time). This sort of play requires a way for players to coordinate with each other, for example using a realtime chat system. A minor crisis involving the details of how to handle this feature was narrowly averted and we escaped to the shores of Ljsselmeer to begin considering the vertical slice, the moustache as core game feature, community service and mandatory fanny packs. Betablocker-DS can now be programmed, and I’ve spent the last week testing it on public transport (with headphones…) Lots of niggles to fix, and not enough samples, but the basic interface works. The DS has such a nice feel – it also seems like a more appropriate interface than the gamepad version. It’s still not really suitable for public consumption, but I’ve updated the binary here. Also I’ve started some minor documentation effort here. This version has a slightly altered instruction set to the original version and is still subject to extensive fiddling! There is a preprint version available on the foam site. Groworld is part of the preliminary program for Pixelache 2011 – we are planning an expanded version of our presence last year, more to follow. 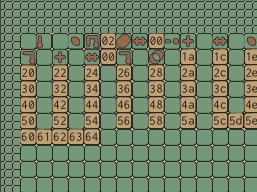 Not too exciting, but it proves quite difficult for my naive system to generate code for. A lot of times the evolution becomes stuck in the average number pattern, eg (25 25 25 25 25 25). In genetic programming (and other similar fields) such stuck states are called “local minima” as the system can’t get itself out of a relatively stable state. The problem is that in order to get to a better solution we may need to get worse first. A good description is that you are trying to find the lowest point in some imaginary terrain, and you are stuck in a puddle at the top of a mountain. Notice that bits of this code are unnecessary, (+ (even 31) 97 22) could be replaced by 119. Some genetic programming systems do this automatically, the approach I’ve taken is to assign a cost to the size of the procedure which should make shorter programs fitter – but I haven’t really tested this works yet. This code has a cost of 31684. I’m squaring what I was calling fitness before, and calling it cost instead, which makes a bit more sense. Then, on generation 31 we get a big improvement, with the cost dropping to 2601. Unfortunately, even after 1000 generations (50 50 0 46 50 45 0 0) remains the closest to (50 50 0 0 50 50 0 0) we get – close, but no cigar. A holiday project run amok, an idea to make version of betablocker for musical livecoding on minimal hardware – eschewing the world of yuppie smartphones for the gameboy ds. 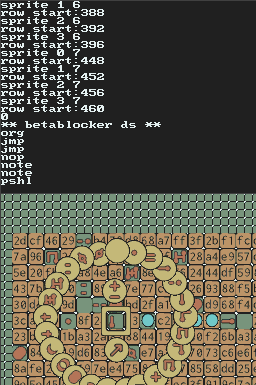 The betablocker virtual machine is up and running, sound is working (although only one sample at the moment) and the tiles are rendered using nintendo’s 2D hardware, with really nice smooth scrolling – as you’d expect I guess. 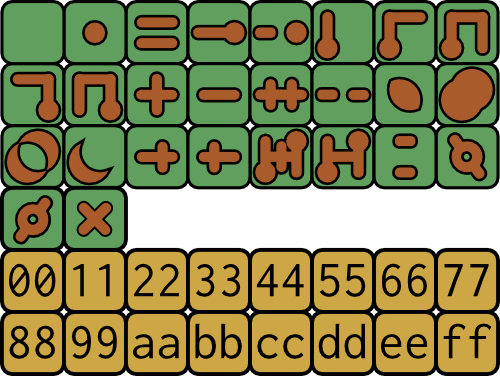 The icons need a bit of work yet, and I’m only using the top screen for debugging at the moment. 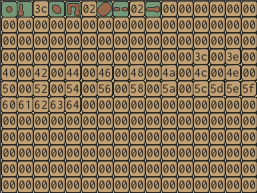 The instructions are represented by images, which are designed to only be a little more cryptic than assembler instructions tend to be. No actual livecoding is possible yet, that’s next. Code here, executable here (you’ll need some additional kit to run it on hardware). I’ll provide some level of documentation, when it is actually working.